These exciting needlepoint pattern ideas offer ten chances to freshen up your home or wardrobe for spring. Choose from quick and easy free needlepoint charts to pre-finished designer kits with everything you need to complete your project, as well as step-by-step needlework tutorials. Stitch as creatively as you like while using up threads, and needlepoint supplies left over from other projects. Make stunning bracelets, necklaces, purses and home decor items in just a few hours or over a spring weekend. Add a fabulous needlepoint accessory to your wardrobe with this easy pattern. Worked mainly in long stitches, you can finish the project in a few evenings and wear it for a spring night out on the town. Choose colors that match your favorite clothes, and make a few bracelets for friends as well. Download and print the one-page color chart and instructions by Cheryl Fall to plan your first color scheme. After you have stitched the bracelet, use the simple finishing instructions to make a unique bangle. Counted Needlepoint-Spring Pattern from NeedleKnowledge. Gorgeous purple and teal green colors bring this fun needlepoint design by Lauren J. Perin to life! Advanced beginners and experienced needlepointers will love to stitch the geometric pattern in four directions and blend and shade the colors. The Rhodes Stitch provides an interesting texture, and a profusion of Slanted Gobelin stitches cover up to four canvas threads so that you can finish the project quickly. The needlepoint pattern costs $18.00 US and once purchased is shipped directly to your home. Add a bit of "hand-stitched bling" to your fashion accessories with this one-hour needlepoint necklace. Perfect for sample fiber packets or different threads on sale at your local shop, each time you make the pendant, you create an unusual jewelry piece. Select metallic braid, overdyed embroidery cotton in spring floral shades to make each necklace unique. Add a few decorative seed beads for accent. The free long stitch necklace pattern is worked on small pieces of plastic canvas. 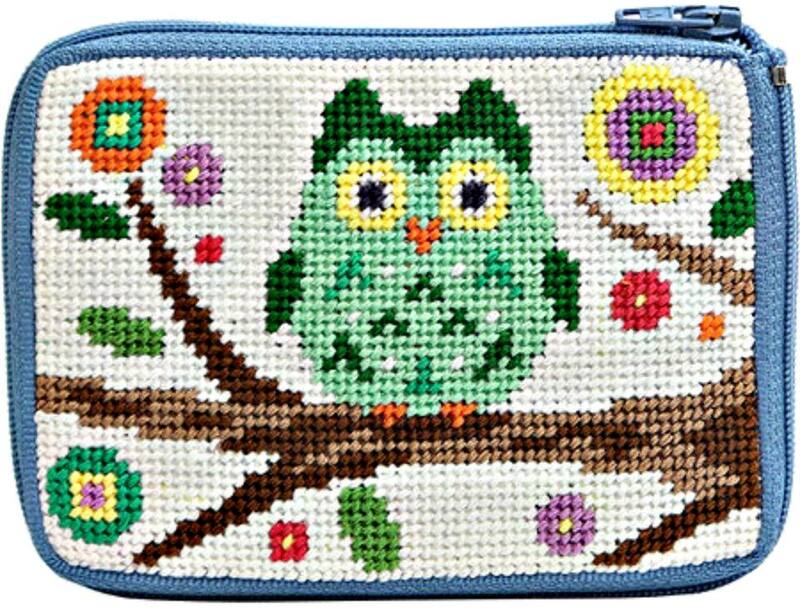 This adorable needlepoint kit by Alice Peterson features a pre-assembled coin purse with a colorful spring owl design stamped on #14-mesh canvas. Once you have finished stitching, the small bag can then be zipped close to hold coins or small cosmetics. Everything you need to complete the project is in the kit. The instructions are very easy to follow. Stitch the owl in the morning and use it that same evening. Engage in some fancy needlepoint doodling with this whimsical puzzle piece design by Lois Caron. The colors and stitch placements are left up to you. Puzzle Pieces are great needlepoint projects for scrap canvas and threads. You can add rows of decorative stitches to make the piece as large as you'd like for pillows and wall hangings. Work it on #18-mesh canvas for coasters and pin cushions. Pick out your favorite colors of embroidery cotton or silk to stitch this fun free spring needlepoint pattern by Charlotte Lamontagne. When you have finished stitching, turn under the canvas edges to make a backing for a smartphone. Make a needlepoint cover for every season or to match your favorite fashion outfits. Stitch a pattern of hearts for spring home decorating. The easy Bargello needlepoint project will keep you creating new pieces with different textures, stitch techniques, and fiber colors. Spruce up a pair of window curtains with tiebacks stitched from this design. Or, whip up a few small housewarming or hostess gifts for spring events. The possibilities are limitless. Orna Willis of Philadelphia has created a beautiful needlepoint bracelet made with variegated threads, beads, and other found objects. You can download the instructions immediately after purchase to start stitching right away. Choose one of three colorways or mix and match to make an original piece. Intermediate and advanced stitchers will enjoy doing this project. The pattern booklet costs $20.00 US. Use this free needlepoint chart to stitch Asian accents for spring decor. The basic pattern is perfect for #10 or a #14-mesh canvas. Use Persian Yarn in warm shades of dark red and burgundy with striking charcoal gray and black hues. Make French Knots for the centers of each flower or sew in gold or silver beads. Experienced needlepointers looking for a spring challenge will enjoy this intricate design. You can work the project on linen fabric or #27-mesh canvas with fast decorative stitches. Download the modern art pattern guide for $12.00 US. You’ll get detailed instructions and stitch recommendations.